We offer a unique and original line of whimsical clocks,magnets and greeting cards. The clocks are not ceramic - they are unbreakable and light as a feather. Our animated alarm clocks feature our own original 'floating second hand', a tiny little image which appears to magically rotate around the face of the clock. Paper Scissors Rock products are available in over 300 stores across the US and Canada. And if you are in Seattle, be sure and visit us at the world famous Pike Place Market. Look for us amidst the flower vendors and other craftspeople. When it comes to decorating, I personally love unique finds! Paper Scissors Rock carries original lines that include wall clocks, nightlights, and stationary. Displaying original artwork in every piece, I was immediately drawn to the "12 Things" Wall Clock (pictured above top). 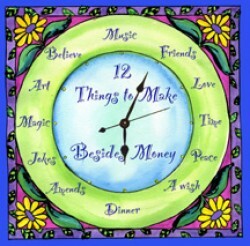 The face reads: 12 Things To Make Besides Money, and at each hour a new suggestion: Magic, Friends, Love, Time, Peace, A Wish, Dinner, Amends, Jokes, Music, Art, and Believe. What a great message! Shouldn't we all make time to enjoy the simplicities in life, rather than constantly worry about the trappings of money? The clock arrived packaged in a gift box (gift ready~if you should chose to give it as a gift, just a pop a bow on and your set! ), and I must say how shocked I was by how incredibly lite it is! As it appears, you would think that it would have some weight to it, however it is lite as a feather (making it super simple to hang- and easy on your walls). It's added a delightful whimsy to my kitchen, and serves as a daily reminder to focus on the more important thing's in life! 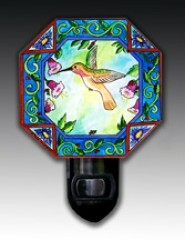 We also received the adorable Hummingbird Nightlight, which also features original artwork. It has added the perfect glow to our hallway at night! Add a touch of whimsy and creativity to your space with an original piece from Paper Scissors Rock. Also, keep them in mind for the upcoming Holiday season, their selection would make the perfect gift for that special someone! Leave a comment~ Visit http://www.psrock.com/ and let me know which item you would love to have for your home. The comment is considered your entry. NOTE: You must be a PUBLIC FOLLOWER through Google Friend Connect to enter any of the Giveaway's offered on this blog. Entry to this giveaway ends on October 7, 2011.Winner's are chosen randomly through random.org.The winner will be announced within 7 days of the giveaway ending and contacted through email. Open to U.S. residents only. The winner will have 48 hrs. to respond or another winner will be chosen. I would love to have the butterfly wall clock! I like the UFO night light. Thanks! From Paper Scissors Rock, I love the Butterfly Wall Clock. I am a fan of Paper Scissors Rock on Facebook.